When you want to spead IoT devices around, there is challenge of powering them. You need to provide power to them or be prepared to change batteries in then very now and then. Great things are expected of the Internet of things but only if engineers can solve one potential show-stopper of a question: how to power these numerous tiny machines. What are the options to this? Energy harvesting provides many options. One promising idea is to harvest RF energy. Simple devices that can link up via Wi-Fi but don’t need batteries could make it easier to spread computing throughout your home. In 2014 there was reports on a new breed of mobile wireless device lacks a battery or other energy storage, but it can still send data over Wi-Fi. These prototype gadgets, developed by researchers at the University of Washington, get all the power they need by making use of the Wi-Fi, TV, radio, and cellular signals that are already in the air. You could for example try to borrow power from TV transmissions or WiFi signal. An article in the MIT Technology Review presents a power-over-Wi-Fi system that uses existing Wi-Fi chipsets in wireless routers to deliver far-field wireless power to various sensors as well as to recharge coin cell batteries at distances up to 28 feet. The ability to power remote sensors and devices using Wi-Fi signals could be the enabling technology behind the Internet of things, say electrical engineers. 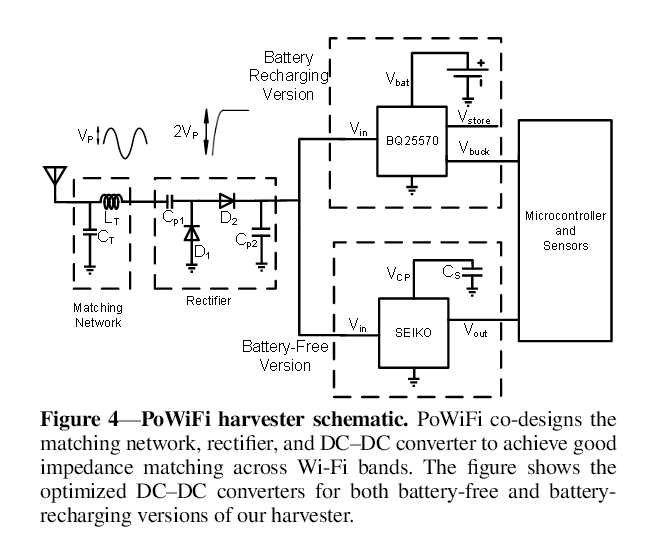 The researchers injected non-intrusive “power traffic” onto multiple 2.4-GHz Wi-Fi channels to increase channel occupancy — while minimally impacting network performance — so as to allow energy harvesting. Talla and co use three Atheros AR9580 chipsets, standard electronics for Wi-Fi routers. However, they program these devices to broadcast in a way that can provide continuous power to an energy harvesting sensor. The results seems to be promising: It turns out that the temperature sensor can operate at distances of up around six meters from the router and by adding a rechargeable battery to the mix. This month there was First Demonstration of a Surveillance Camera Powered by Ordinary Wi-Fi Broadcasts.The demonstrated battery-free camera can operate up to [about five meters] from the router, with an image capture every 35 minutes. For more details on the technology take a look at “Powering the Next Billion Devices with Wi-Fi” paper. The significant unanswered question is this: how do these routers interfere with other signals? There are challenges, but UW’s “PoWiFi” could power the Internet of Things, says MIT Technology Review. There have been a few reports of power over WiFi (PoWiFi) on the intertubes lately. If this is a real thing it’s definitely going to blow all of the IoT fanboys skirts up (sorry to the rest of you *buzzword* fanboys, the IoT kids flash-mobbed the scene and they mean business). All of the recent information we found points to an article by [Popular Science] titled “Best of What’s New 2015”. The brief write up includes a short summary lacking technical info, and fair play to [PopSci] as it’s a “Best Of” list for which they hadn’t advertised as an in-depth investigation. After a bit of digging around we came across the actual article on [Cornell University]’s e-print archive where you can download the PDF that was published. As you can imagine PoWiFi is currently limited to powering/charging very low power devices that are used intermittently. The research team was able to charge a Jawbone headset at a rate of 2.3mA for 2.5 hours which resulted in the battery going from 0-41%. The punchline here is the distance, the device being charged was only 5-7cm from the PoWiFi router which is getting close to inductive charging range. At the time of writing this article it seems that PoWiFi is best suited for devices such as: low powered sensors and motion activated cameras that have increased energy storage capacity, which the team mentioned as one of the continued research possibilities. The tiny, only thumb-nail sized WISP or Wireless Identification and Sensing Platform is a wireless programmable computer. It uses energy much the same way as the RFID chips will receive, that is, it changes the transmitter to radio waves carried to a small amount of electricity. This small amount is sufficient not only to the WISP in the operation, also gives it enough power to stay awake for a moment. During this time, the device can be upgraded or completely re-programmed. The biggest difference that develops will be the Internet of Things for. WISPin help from literally just obtained from the use of sustainable smart devices, as small appliances no longer need the battery or AC power, and they never need to recharge. Today, the biggest hurdle when it comes to designing new gadgets is battery technology. These big, bulky things restrict the forms our smartphones, computers, and wearables can take, and unfortunately, battery technology is so stagnant that there’s no promise of things getting better any time soon. The WISP isn’t designed to compete with the chips in your smartphone or your laptop. It has about the same clock speed as the processor in a Fitbit and similar functionality, including embedded accelerometers and temperature sensors. Surprisingly, Parks says this technique is pretty fast. It has about the same bandwidth as Bluetooth Low Energy mode, the wireless power-sipping technology which drives most Bluetooth speakers and wireless headphones. That’s what gives the WISP—which has been knocking around as a project since 2006— its new killer feature, thanks to a team-up with the University of Delft: it can now be reprogrammed wirelessly. So, for example, a fitness tracker running on WISP can now download a new tracking function, or be updated to fix a bug or glitch, without plugging it into anything. That’s important because it’s never been done before. The WISP isn’t the only battery-free computer chip out there. Parks says there’s also ambient battery-free sensors that leech whatever power they can, from passing television waves, cell towers, and so on. But right now, these ambient battery-free computers are very slow, and aren’t remotely programmable. By pairing the WISP with an RFID reader, Parks says they’ve been able to make a battery-free computer that’s up to 10 times as powerful as an ambient one. But where WISP could be used right now is architecture. By embedding these sensors in concrete structures, inspectors could detect whether or not a building’s foundations had been damaged by an earthquake—without cracking anything open. Parks also says battery-free computers are perfect for implantable devices, to monitor patients’ health. There’s also interest in WISP-like computers from the agriculture industry, which sees value in it as a way of monitoring thousands of plants at a time. WISP, the Wireless Identification and Sensing Platform, is a family of sensors that are powered and read by UHF RFID readers. WISPs do not require batteries since they harvest their power from the RF signal generated by the reader. The WISP is an open source, open architecture EPC Class 1 Generation 2 RFID tag that includes a fully programmable 16 bit microcontroller, as well as arbitrary sensors. Unlike the WISP, conventional RFID tags are black boxes that cannot execute arbitrary computer programs, and do not support sensors. We have given WISPs to collaborators around the world. Many of the applications have been sensing related, but we were also surprised to find many applications in the areas of cryptography and security, enabled by WISPs programmability. One of the problems with the Internet of Things, or any embedded device, is how to get power. Batteries are better than ever and circuits are low power. But you still have to eventually replace or recharge a battery. Not everything can plug into a wall, and fuel cells need consumables. Entire online economies rely purely on data collection, and how that data can be used to turn a profit. That data collection is even relevant in your own home, and most IoT systems have tools in place to track how they’re used. But, those require power and relatively expensive electronics. These new 3D-printed objects, however, are designed to collect, store, and transmit usage data without any electronics at all. Researchers at the University of Washington have developed 3D printed assistive technology that can track and store their use — without using batteries or electronics.